A Somerset touring park, which saw motorhome visitors leap by almost20 percent last year, predicts the passion for freewheeling lifestyles will continue in 2018. Bath Chew Valley is making itself even more motorhome friendly. But Bath Chew Valley Caravan Park, set in the tranquil Mendip Hills, says the on-trend image of motorhomes is not just driving up bookings. It’s also bringing down the average age of guests as younger couples increasingly view them as a way of making holidays more of an adventure at any time of the year. Now the family-run park has moved to make itself even more motorhome friendly by providing pitch facilities for campervans and motorhomes up to nine metres long. It’s also introduced its own by-the-hour car hire facility so that guests can explore the countryside in greater comfort, and park more easily in nearby destinations such as Bath and Cheddar Gorge. Director Keith Betton says that in contrast to when the park first started, almost half of his park’s pitches are now occupied each night by motorhomes: “Motorhomes enjoy a very chic image, and I’m sure that’s helped by their association with music festivals, film sets, and the spirit of laid-back living,”said Keith. “Add to this the fact that motorhomes are all about discovery with ever changing horizons to enjoy, and you can see why they appeal especially to younger couples. “And there’s no need to sacrifice comfort these days, thanks to recent design innovations. Even compact motorhomes now boast home comforts such as full-size beds, luxury shower-rooms, fully-equipped kitchens and central heating. “We’re seeing an ever-widening range of ages on the park, and motorhome owners are just as keen as our touring caravan guests to enjoy socialising together!” added Keith. Based in picture-postcard countryside near Bishop Sutton, five-star Bath Chew Valley is an adults-only park which has scooped a raft of awards for its quality standards. They include previous firsts in the adults-only category of the annual “Top 100 Sites” survey, as voted for by readers of Practical Caravan and Practical Motorhome. World-famous botanist David Bellamy has also praised the park’s care for its abundant wildlife, and honoured Bath Chew with his Conservation Award at its top gold level. 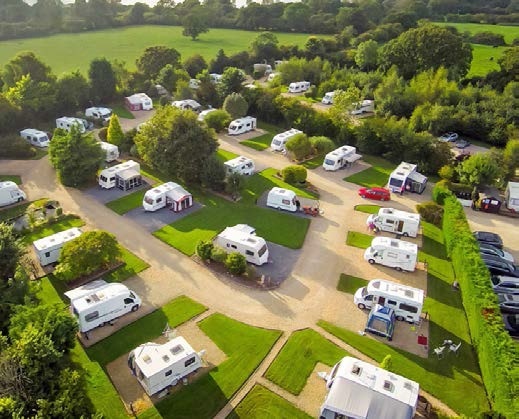 The park’s 45 pitches are spread across more than four acres of landscaped grounds, and has been owned by the Betton family for over 20 years.